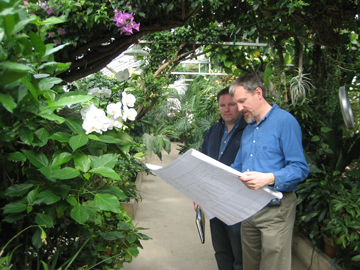 We specialize in engineering services for commercial, institutional, and research greenhouse facilities. Our services including site planning, feasibility studies, business planning, system specifications for both greenhouse and growth chamber facilities, cost estimation, building condition assessments, energy studies, engineering design services, bid and construction supervision. We provide drawings and specifications for tender with construction cost estimates based on multiple comparable past projects across North America with our partners. Our client list includes architects, insurance companies, greenhouse operators, manufacturers, homeowners, contractors, and institutions. We can design a wide variety of greenhouse facilities, ranging from plant production ranges, garden centers, compartmentalized research greenhouses, bio-containment greenhouses, conservatories and custom structures. We have extensive experience with hydroponic vegetable production systems including NFT and media based systems. We also design controlled environment agricultural facilities such as mushroom systems and growth chamber facilities. These design services include facility layout, material processing/ handling equipment, service requirements, automated irrigation systems and containment consideration. GShort.com LLC, was formed as an LLC in 2006 from a company formerly known as GS Engicom. That company was started in 2001 as a Website Marketing and Design business. In 2006, Gregg left the hydroponic greenhouse company CropKing Inc, to run the business and expand his greenhouse consulting business. As of 2014, we no longer take on new web marketing and design projects. While we enjoyed that part of the business, keeping current on web marketing trends and technology was taking too much time away from our primary passion of greenhouse consulting. We are now focusing all of our attention on those clients. To contact us online, please use our form.